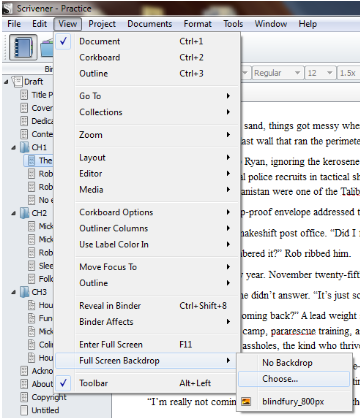 Scrivener for Windows has had several updates in the last few months. Even if you bothered to skim through the list, here are a couple of cool changes that might have skipped your notice. I’ve been waiting for this one to come to Windows for a long time because it makes understanding the Formatting tab in Compile so much easier (great for teaching too). 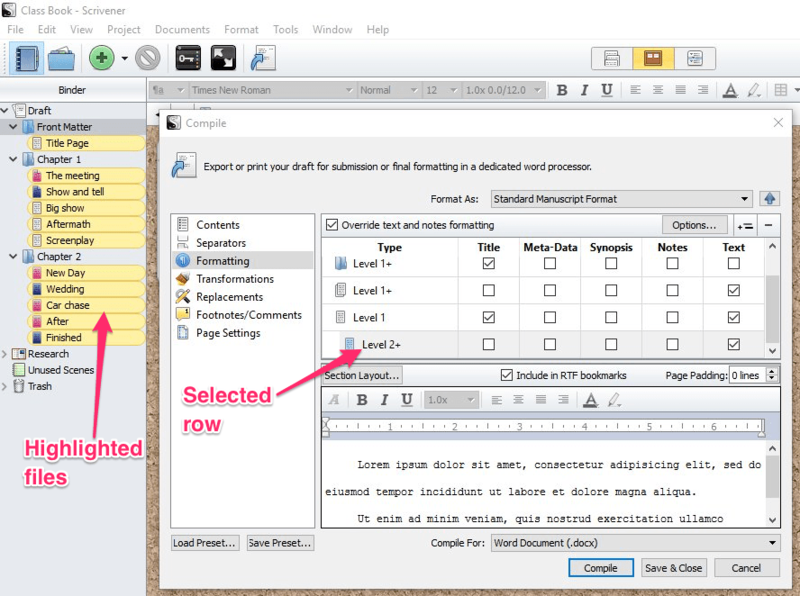 What happens is that when you select a row in the Formatting tab, the documents or folders affected by settings for that row are highlighted in the Binder. No more guessing if you made changes to the correct row. NOTE: If you choose “As Is” for a document in the Contents tab, it is not affected by the settings in the Formatting tab even though it’s highlighted. Same for documents not selected for inclusion in the Contents tab. I’ll be surprised if they don’t fix this eventually, so keep an eye out. Need to get rid of extra paragraph returns or tabs in your project? Doing so in the Windows version used to not be so easy. Now, with support for non-printing characters, it’s a cinch. 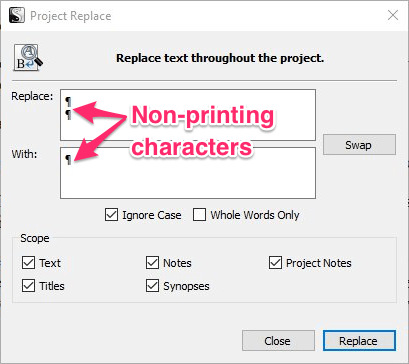 You can use keyboard shortcuts to enter the desired non-printing character when using Project Replace. Check out this post for the full procedure. There’s more! Reading the change logs can make your eyes cross, but there are often gems in there. You might also find that a bug plaguing you was fixed. It’s worth a look. The update to 1.9.7 is highly recommended as it purportedly fixes an issue “that could lead to the loss of text annotations during sync with iOS.” If you’re a couple of updates behind, no problem. You can skip straight to the latest version. Not sure if you're up to date? Go to Help—>Check For Updates. Anything other recent changes you’re excited about? Here are just a few of the additions I think will make PC people very, very happy. Creating your own TOC used to be a pain. Now it’s a cinch. 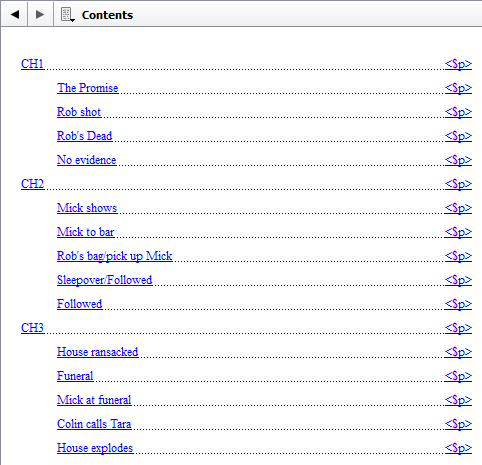 Just select the items in the Binder that you want to include in the contents list (using Ctrl+click or Shift+click). To create a TOC with page numbers (say for a POD book or Word doc), go to Edit—>Copy Special—>Copy Documents as ToC. Create a blank document and paste the list. To create your own ebook TOC (maybe more or less detailed than the one that’s created automatically), use Copy Documents as Scrivener Links instead. If you have a section of text with special formatting that you don’t want to lose when you compile, you can preserve it. 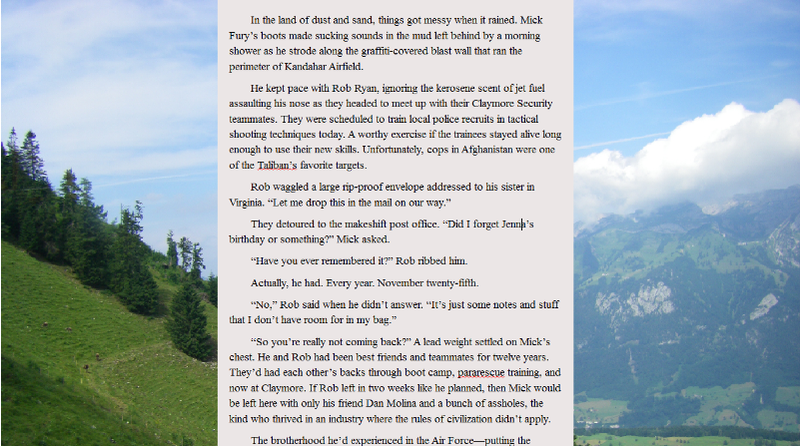 Scrivener will protect the font, alignment, font size, spacing, everything. Just select the desired text and go to Format—>Formatting—>Preserve Formatting. Want to apply a group of font and/or paragraph settings to select sections of text over and over? You can create and apply presets. This works nicely in conjunction with Preserve Formatting to apply style and preservation to things like quotes, representations of letters, text messages, or emails, or subheadings that you’ve embedded directly into the text. Presets are found under Format—>Formatting. See this post for more on how presets and preserved formatting work. To add the Preset Selector button to your format bar, go to Tools—>Customize Toolbars. Select the Format Toolbar in the box at the top right. In the left column, select Preset Selector (should be near the top) and click the right arrow button at the center to move it to the right column. Use the up/down arrows to adjust its position, if desired. You can now customize the icon for any object in your Binder. Just right-click the item and choose Change Icon. In the past it was difficult to add an image to the full screen backdrop, and if you did, it affected all projects. Now you can quickly select a backdrop image, and choose a different one for each project. Go to View—>Full Screen Backdrop. You can then select an image from the list (culled from those in your Binder, if any), or click Choose to select an image from any drive attached to your computer. Click here to learn more. If you’re like me, you can think of several uses for the Project Notes section. No need to choose, or clutter up the space. You can now create multiple project notes and toggle between them by clicking on the Notes header. 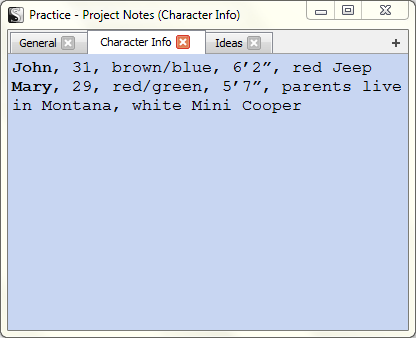 To create a new project note, click the Notes header in the Inspector and choose Manage Project Notes. In the Project Notes Window, click the [+] button to add a new note. Click the X on a note’s tab to delete it. Do you have a form you like to use over and over? For example, a character information sheet. 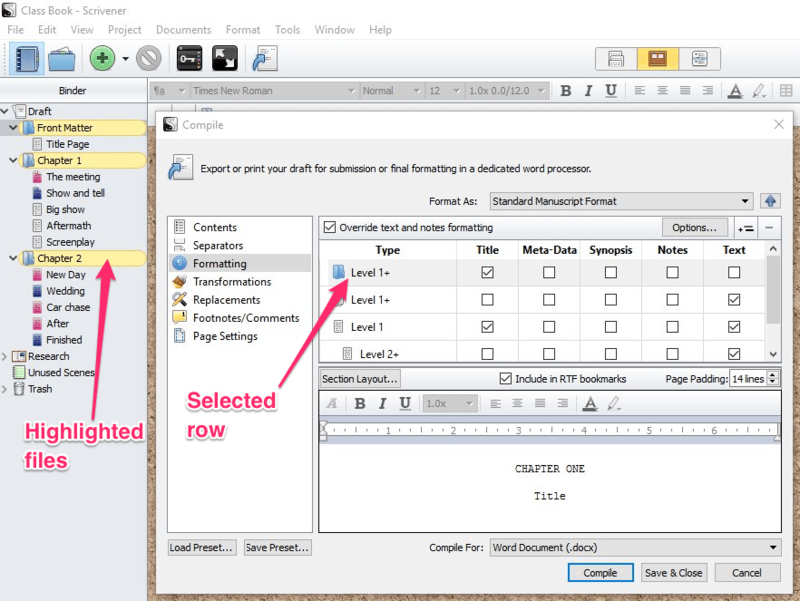 Now you can create document templates and then create new documents using the template. This way you won’t overwrite your original, and creating a new one is a snap. The Novel template comes preloaded with Character and Setting Sketch templates, but you can create your own. There have been several much-needed updates to the Compile function. Here’s a quick list. – You now have the ability to create one or more front matter folders outside of the Draft that can be added in when compiling. You can have one for your ebooks, another for your print version, and still another for your submissions to editors/agents. – The compile preview should provide more accurate results since it’s now based on PDF output. – There are more options under Transformations tab, like Remove Highlighting and Remove Text Color. And there’s much more (e.g. adding custom meta-data, additional placeholder tags). For the complete list, click here.